Special characters are the bane of my scripting hobby. In dealing with text on a daily basis and constantly playing around with scripts and macros to make text editing faster, I inevitably come across the occasional Unicode Error that increases my headache and coffee consumption rate. Which is why, if you have the same issues with Python, I recommend watching this video that Dr. Drang kindly sent me a few weeks ago on Twitter. 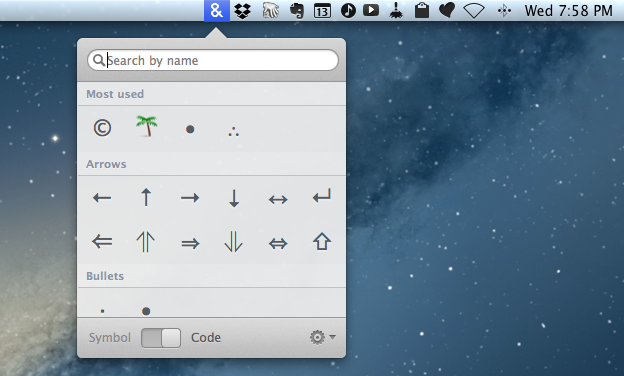 Characters for Mac is a menubar app that wants to make the process of copying special character effortless and simple for both users and developers. Characters isn’t necessary, per se. Every modern Cocoa app comes with a Special Characters menu under “Edit” (also accessible with a keyboard shortcut) that allows you to copy characters (or their info) into the system clipboard. The Characters app, however, has some nice additions that are worth considering if you deal with these characters frequently. The app runs in the menubar and can be assigned a keyboard shortcut; when you invoke it, you can start typing right away to search for a character’s name such as “copy” for “Copyright” or “man” for “Man and Woman Holding Hands”. This is nice if you remember the Unicode name of a character. Unlike Apple’s Character Viewer, Characters doesn’t have Favorites but a Most Used section at the top of the list. These sets can be scrolled vertically, with section headers snapping onto each other like on iOS. As far as presentation goes, I prefer the cleaner look of Characters to Apple’s OS X menu. The best part about Characters is how it lets you copy characters to the clipboard. With Symbol mode, you can select a character and click it (the app doesn’t support CMD+C) to copy it; with Code mode, copying the character won’t copy the symbol but its HTML Entity or Python source. HTML Entities can be formatted as Name, Decimal, or HEX; Python code will be returned as Unicode, ready to be pasted in a Python script. I like Characters. Finding HEX and Unicode source codes for special characters is annoying, and Characters makes it easier with two different options that are both welcome. Characters is $2.99 on the Mac App Store.